The 23rd story in the Falling Into College series by Richard Lobinske. The story occurs during mid-June 2000. Daria's new glasses by RLobinske. Accepting the obvious need, Daria gets a new eye exam. Unusual for her age, the new prescription includes bifocals. 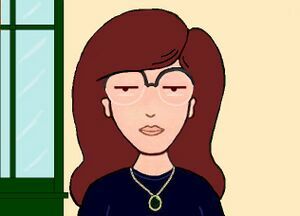 Daria is upset with the available selection of frames and somewhat irrationally worried about her changing eyesight. When Daria tells Jane she's going back to the doctor for more information, Jane asks if she can give one of the children from the hospital a ride. Olivia is a six-year old in a rigid support frame for her neck. Just as Daria is worried about her future sight, Olivia is worried that that if she hurts her neck again, she won't be able to walk. This page was last edited on 4 October 2014, at 09:39.